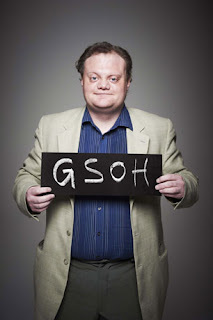 Tv-ooh has occasionally pondered, in between watching television or eating crisps, if having a learning disability can often be similar to not having a learning disability. The only difference might be that the learning-disabled are equipped with less-advanced social skills or an inability to stop themselves from showing how they might really feel, which in some cases might be a compulsion to shout 'F**KER!" while in Asda. In other words, people with a learning disability are often not that different from anyone else, and it's this approach, sort of, that forms the basis of the Channel 4 documentary series about people with disabilities, both mental and physical, looking for love. And as if to hammer the point home a bit more, it's been named The Undateables - if only to highlight our own discomfort about people with disabilities needing love as much as anyone else. Episode two followed a sweet-natured poet from Bournemouth called Shane, a 31 year old man on a quest for love but equipped with an unspecified learning disability that makes him prone to slightly unfashionable clothes, an inability to talk to women he likes, and a longing for love - again like many of us too, especially the bit about slightly unfashionable clothes. And in taking a proactive step that might put some of us non-learning disabled romance-seekers to shame (particularly those of the 'moping' variety), he decided to join a dating agency, run by two women who each have a learning disability too (although it looks like the weary-looking support workers do most of the donkey work like filing and phone answering), and the hope is that their questions would lead Shane to his first date in several years. "What are your likes and dislikes?" they ask. "My likes: Doctor Who. Dislikes: Spicy food." The two women look at him blankly. Is this us laughing at Shane's expense, or an honest depiction of some of the unintentionally funny moments found in the process of signing up to a dating agency and therefore justifiably included in the story? To be honest, it's probably a bit of both but the outcome for us is that Shane becomes more likeable, even if he himself was unaware of the comedy. A later example feels less comfortable, as we see his vulnerability on full display: his rambling and self-conscious voice-mail message to arrange a second date with the glamorous but mysteriously non-speaking Jackie, in which his awkwardness means he fails to get to point of his message and so an off-camera director has to advise him on how to end the call. As well as a reminder that many people with learning disabilities never truly lose the need for day-to-day guidance - again like many of us, but obviously in a completely different way - it's also hard not to feel embarrassed for him, despite his bravery for doing something he found difficult. The result is that, by the end of the film - the second of three - you're rooting for a happy ending for all of the participants - 29 year old Carolyn, a wheelchair user, who meets up with the nice Wayne for a drink; and Justin, 39 and with neurofibromatosis 1 which means he has tumours on his face and whom we leave hoping he'll get a second date with a woman who is fond of cats. But somehow, despite what turns out to be warm, witty but also thought-provoking film, you're also left feeling a happy ending might not be very likely - at least not this time. And for Shane, on his second of two dates with the non-speaking Jackie from London in which, during an all but silent meal, she rejected his invitation for them to be boyfriend or girlfriend, and with only a one-word reply, too: 'friends'. Shane's search for love continues, and we're all right behind him. Why are they undateable? I think it is cruel and unnecessary. TV at its voryeuritic worst.